I spend most of my working day sitting at a desk, typing. The comfort of shirts and size of armholes are therefore important. But I also need silent cufflinks. Most of the time I wear French (or double) cuffs on my shirts, so they need to be fastened with something. That used to be variations on bar or chain cufflinks, always metal and usually quite loose. They clinked against the desktop. Even with a jacket on, they would often peek beyond the sleeve and clink. So I switched to silk knots. Easy, cheap and available in an array of colours, they allowed me to experiment with colour combinations and clashes. Add cufflinks to tie, handkerchief, socks and shirt and the permutations are dizzying. Most importantly, they didn’t clink. I do own three pairs of metal cufflinks. One, in silver, was given to me by friends on my 21st birthday. A second in mother-of-pearl was an engagement present. And the third pair, from Etro, has an unusually short bar and so does not clink. But I occasionally get bored of silk knots and occasional metal links, usually worn on special occasions. So I was glad to receive a birthday present this year from my friend Katherine: an unusual pair of homemade cufflinks. Essentially two buttons joined with silk thread, they look like oversize shirt buttons when worn on the cuff; but they’re more decorative than knots and if anything offer even more colour combinations. And of course, they don’t clink. The company is called Sebastian & Jules and can be found at sebastianandjules.co.uk. Katherine makes the cufflinks (and rather nifty iPhone cases from tweeds and worsted suitings) in her spare time. It’s a cottage industry; except that she lives in a flat in East Dulwich. 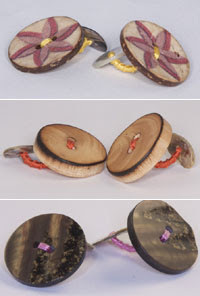 I have the paint-fleck effect shell ones on page two of the site, the ones joined by hot fuschia silk. They look particularly effective on a white shirt under a navy suit. I also hanker after the pine and tortoiseshell. I have a growing fascination with buttons (expect a piece soon on using mussel-shell buttons for my fishy suit), so these links are very much on-trend. I also think £15 is pretty reasonable for unique items that were entirely and painstakingly made by hand. Nice to support a (for me, very) local producer. You can follow the discussion on Sebastian & Jules cufflinks by entering your email address in the box below. You will then receive an email every time a new comment is added. These will also contain a link to a page where you can stop the alerts, and remove all of your related data from the site. Excellent post. I have been exploring buttons for new and old suits alike. I love the Sebastian & Jules cufflinks. I do hope the add some more soon, I just purchased the last two sets on their site. I’m a huge fan of silk knots for everyday wear. They’re a bit more understaded, as well as being quieter, as you note! I might well look at these button cufflinks though; they definitely look like an interesting option! Just been on the sebastianandjules site, and I am all over a herringbone iphone cover!! Thanks for bringing this to my attention Simon, I think a pair of the button cufflinks will be next. Keep up the good work mate, be sure to check out savilejoe if you get a minute. Shames – appears the site is down. Are they still in business? Don’t know, I’ll ask Katherine.